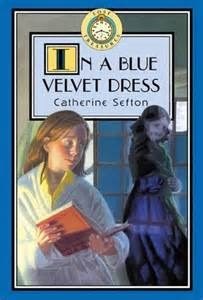 Today's timeslip book, In a Blue Velvet Dress, by Catherine Sefton (1973), is an older one from my shelves...and at first I though I misremembered it had time travel in it, because it seemed like a ghost story. But happily I enjoyed the re-reading of it enough to keep going, and indeed, there are time slip elements toward the end. Jane's parents have gone off on a sailing trip to Scotland, leaving her in the care of a middle aged couple who love children and have none of her own, in a one horse town in Northern Ireland. Jane, somewhat disgruntled about being dumped, has fortified herself with a whole suitcase of her favorite books (she is an inveterate bookworm). But when she unpacks, she realizes to her horror that she has her father's suitcase instead (and he has all her Chalet School books etc., which is doubtless dismaying him too....). The house where she's staying has only the telephone book, and even Jane can't read that, and there is no bookstore. Horror! But then every night a new book appears on Jane's bedside table, only to vanish the next day. Some are old favorites (E. Nesbit), others are old book's she's never heard of. And then Jane realizes that her mysterious benefactor is the ghost of a young girl, a friendly ghost, Mary, who also loved to read, whose father had drowned at sea. One night she slips though time to the bookroom of Mary and her father, and a lovely room it is! When Jane's parents sail back from Scotland into a fierce storm, and the lightboats are called out to rescue them, Jane is of course horribly afraid for them, but Mary comes to comfort her, and time slips again, so that Jane sees the night long ago when Mary's father drowned. Jane's parents are more fortunate, and Jane realizes that far from Mary wanting to be helped, Mary came to help her, because she is really just about the nicest bookworm ghost anyone could ever want. There's more to the story--Jane makes a real life friend as well, and they go exploring and have a few minor misadventures (which is good for Jane, because reader though I am reading isn't everything! ), and there are many bits of humor. But mostly the appeal of the story is Jane's hunger for reading matter! The time slipping is minor, and doesn't exactly Advance the Plot, but it makes the book more magical. I'm glad that I held on to it--it was a very nice re-read. Happily it was reprinted in 2002 (the edition shown above), and so there are cheap copies around if you want to try it!